There’s only so much an ‘elite’ university can do about widening participation if applicants won’t list us on their UCAS fo rms. Even less if they’ve decided, even before leaving primary school, that university is not for them. Or so it might seem. UCAS released an excellent report – albeit one rather lost in the madness of mid-summer – that helps us to understand what factors influence applicants from different social groups. 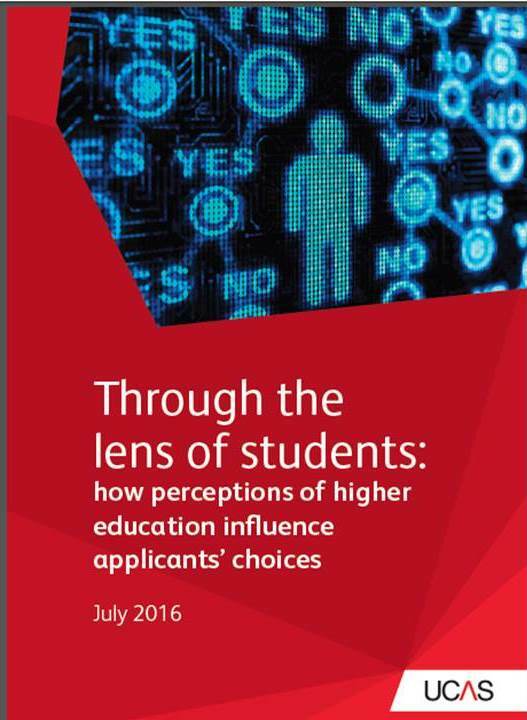 Through the Lens of Students: how perceptions of higher education influence applicants’ choices uses ‘POLAR’ data to classify the applicants, then breaks down universities according to their level of tariff-on-entry. The division between ‘high-tariff’ and ‘low-tariff’ is a bit basic, but helps to make some powerful points. For a university like mine, which struggles to make headway on widening participation, it offers some valuable intelligence that might help to redirect efforts. And for someone like me, who looks out at the faces when giving open-day talks and wonders what they’re making of it all, it’s especially helpful. Applicants from higher social groups more commonly decide to apply to university at a younger age. Indeed 25% of respondents in this survey had made the decision by the age of 10. Those from lower social groups more commonly decide later. Maybe that won’t surprise us. People with no family history of university participation, and maybe no role models, are unlikely to be setting their sights on this goal from an early age. But there’s also a correlation between the age at which this decision is made and the kind of university the applicant eventually chooses. Those choosing later are less likely to end up at a high-tariff institution. There’s a lesson here, it seems to me, about the role that universities can play with younger people, years away from facing a UCAS form. One of the children in my daughter’s year 6 class identified the single most memorable day from seven years of primary school as being the one, three years earlier, when s/he had visited my university. The campus is only half a mile away, but many peopole from the town never set foot on it. But while such outreach efforts can manifestly change lives, they win little credit in terms of widening participation because the effects are difficult to measure and the children are unlikely ever to apply to our university. But if OFFA was looking for meaningful national change, rather than isolated actions and entry-targets for individual institutions, this might change. At present, by the age at which potential applicants are getting seriously targeted, with access programmes and the like, too many have already decided either not to apply, or not to apply to a higher-tariff university. When asked about the expected challenges of higher education, applicants from different social groups give distinctly different answers. ‘The most disadvantaged groups,’ the report states, ‘focus more on the actual university experience – the practicalities like transport and accommodation’. The most advantaged groups, meanwhile, ‘tended to focus on the importance of growing a network’. Maybe this is just telling us the blindingly obvious: those with greater financial security have the luxury of thinking beyond material necessities. That trend will only become more pronounced with the demise of maintenance grants. But these data also suggest the hidden challenges that such students will face. They may have been deterred by higher-tariff universities due to to a perception of higher costs. And even if they do make that leap, they may not necessarily grasp what their advantaged peers seized from the outset: the value of ‘growing a network’. Successful university experiences can be measured in terms of gains in social capital as well as knowledge and skills. For higher-tariff univerisites, the lessons here are two-fold. On the one hand, if we’re aware of the concerns that applicants bring with them to oopen days, we can better tailor our advice. On the other hand, once applicants become students we must surely accept a degree of responsibility to ensure that all students are appropriately supported to gain in every way from their university experiences. For a subject like mine – English – this raises the stakes. The socially advantaged students enrol in our degree safe in the knowledge that it opens all sorts of doors. It’s like they’re in on the secret of UK graduate employment: the enduring value of a good traditional academic degree. The socially disadvantaged, meanwhile, might opt for a degree that sounds ‘vocational’ but that leads to a bit of a dead-end. That presents a really interesting marketing challenge for many of us: we’ll definitely take it on board for our open-day presentations. I think it also presents a challenge for subject associations, especially at a time when applications for some humanities disciplines (including English) are trending downwards. So how to change perceptions – of universities and subjects alike – if we can’t even get the disadvantaged applicants onto the campus? Until we can fix this, we battle against decades’ of reputational accretion. It’s the ‘University X is not the right place for a person like me’ syndrome. The UCAS report has some good ideas in response, including travel bursaries; although, as I’ve said before, questions of institutional identities and resulting cultural diversity (or lack thereof) are seriously sticky problems. Existing WP practice and discourse is not necessarily fit for purpose.